Being in business for oneself can both be a scary and exciting thing. But for me it's more about the freedom and independence that comes with the territory. I've never been too keen on following the lead of others so ultimately my destiny was to be an entrepreneur. But a good entrepreneur knows his/her limitations and takes the initiative to locate the best resources to get things done the right way, which I'm trying to do at the moment. Going freelance is more than just make-up, there's a business component to it as well. With the various tags of inc., llc, co. and etc. I don't know where to start and where I'm headed in the market. But thankfully I have a local small business development center to turn to. From my research it's a great place to learn how to start a business. Once a month they hold a three-hour seminar that speak on the seven basic requirements for a business start-up. Aside from the seminar, they have one-one-counselors available for personal help and other valuable resources. It's been quite helpful for people that I've talked to so I know that it'll be a valuable experience. So that'll definitely be an addition to my summer list of to-do's. Even though my blog will heavily be based on my make-up trials and tribulations, I want to dedicate one weekly post to the business side of it all because I think that it's so important. So whatever I learn, I'll be sure to share. So, enough of me blabbing, go ahead and enjoy your weekend. As for me my weekend is kick starting with doing make-up for a client tonight and a fancy girls night out tomorrow. Hopefully I'll be able to post the photos's for both my Clientele Highlight and Look of the Week next week. 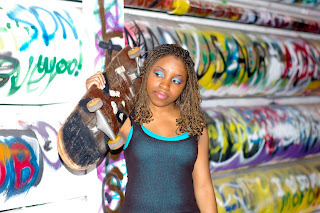 I still have other pics from other photoshoots that I need to post, so we'll see how that pans out. Well, I had the last interview and it went really well. But before that final interview I tested two new items to see whether or not they'd make appropriate additions to my kit. With the New MAC Style Warriors collection that recently came out I was really interested in their Lustre Drops. 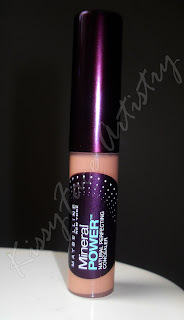 But after getting a tip from Reflections of Beauty that there was a dupe available, instead of dishing out $18.50, I paid less then $9.00 at Wal-mart (I can't recall the exact retail price, sorry.) for the comparable. 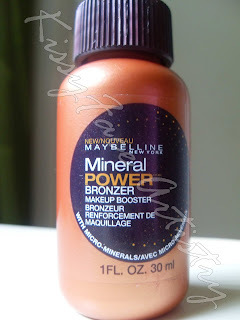 I mixed a little with the foundation, more so 3 parts foundation to 1 part bronzing liquid. After mixing the two I applied it to my face. I've been taking as of late. KissyFace Approved? : Definitely. But it only comes in one color. MAC has three options. I plan on purchasing Pink Rebel from MAC just to add variety to my kit. Tip: You have to be very careful when mixing it in with your moisturizer or foundation that it doesn't over power your look. Incorrect proportions can have you looking like an over-bronzed dame, unless that's the look you're trying to achieve. My application wasn't done with my handy fingers like usual but with a new brush I picked up. 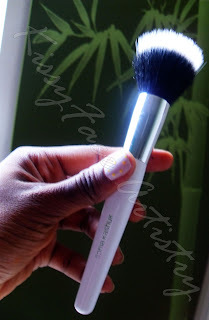 Personally, I am not a fan of the traditional foundation brush and have been on the hunt for a better alternative. And this past weekend I found it. 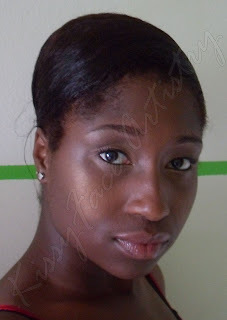 Initially, I purchased a $34 Air Brush from Sephora. I must admit that it was uber-soft but I never got to use it, with good reason. After hitting up Target and browsing through their Sonia Kashuk brushes, instantly I wanted to head back to Sephora and return the recent purchase. 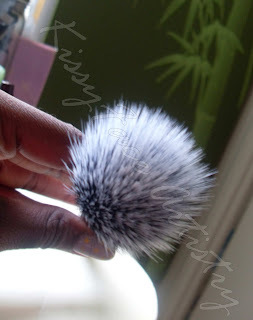 I saw a Sonia Kashuk Duo-Fibre Stipling Brush. And get this it was only $11.99! I could almost get three Sonia's for one Sephora, so that was a no-brainer, right back to Sephora the Air Brush went. But no regrets, I was pretty impressed with the alternative. KissyFace Approved? Yes, 10x over. For such an economical price, I'll definitely be adding at least three or four of them to my kit. 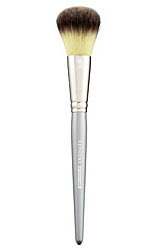 The bristles worked effectively and blended my foundation effortlessly. Have a great Thursday all! As for me I'll be attached to the library doing some much needed studying. P.S. And a little fun fact about me is that I love painting my nails. Whenever I look down at my nails after a polish change or design upgrade it just brings a smile to my face. I did this on Memorial Day. 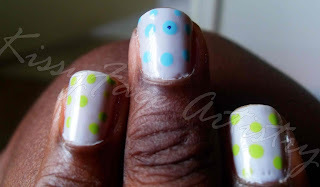 I've been antsy to do polka-dotted nails for a while and I finally did. And the little black dot is a pen mark. I was being impatient and wanted to test if it was dry but didn't bother fixing it. Aside from that, they came out pretty nice, right? Expanding My Horizons: Events/Conferences Galore! 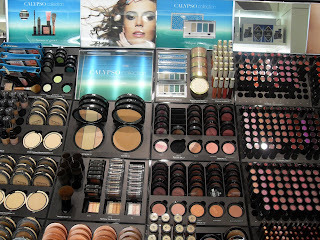 If you've been under a rock in the Amazon then you probably haven't heard about this past week's The Makeup Show NYC, a yearly event that brings beauty enthusiasts from around the country together for the love of make-up. As great as it would have been to attend, the pockets were giving me the side eye and saying, "hex nawl. Don't you dare" lol. But nonetheless after reading countless other blogs and watching numerous Youtube videos, it was like I was there, not missing a beat. But as soon as that were over, a slew of other opportunities have popped up. After getting a Tweet from ClumpsofMascara, I was informed of a local event in Orlando, Premiere Orlando International Beauty Event. But it's just around the corner and right before a major exam (darn it!). So that's crossed of the list. But after doing a little more digging, I found a few more events. I may not be able to attend but I felt the need to share. You never know, you maybe can attend or probably share it with others. After getting another Tweet Update from ScandalousBeauty, I learned about IMATS (International Make-up Artist Trade Show). The event is open to the public and is a location for make-up artists, vendors, manufacturers and enthusiasts to discuss, display, discover and collect on everything make-up. But thats around the corner as well, slated for June 20-21. So that's scratched off the list too (or maybe not, lol). And another one that I had to sadly cross of the list of opportunities was BlogHer Conferences set for July 23-25 (Actually, I'm still debating). It's hosted in Chicago and from what I've read it's a weekend filled with more of the business side of blogging, which may play a great role with what I'm specifically trying to persue. It seems to be loaded with speakers on a range of topics and another opportunity to network. But no worries, after a little more research, I finally found one that's a little further along in the year, which gives me plenty more time to plan and prepare for properly. And that is::drumroll please::—Blogalicious Weekend. It's only one state away and I sure do love a good road trip. And after visiting the site to get some information on what they have to offer, it seems like a great atmosphere to meet some other bloggers. It's described as a weekend getaway for women of color to get together that combines all the things women love about blogging with the added element of face-to-face interactions. But that's not what really sold me on the event. It was the itinerary for the weekend and the keynote speakers. I may be new to beauty blogging but I really want to soak up all that I can from all perspectives. All I know is that the pockets are going to have to get a little fatter in order to officially add these to my agenda, but best believe I'm working on that. And speaking of fatter pockets, I have a third interview for the same retail position I mentioned on Monday. I really hope I get this job because I've never experienced a three-interview process. Well on that note, I'll bid adieu! P.S. If you're aware of any events later on in the year, I'd definitely love to learn more about them. Thanks in advance! Well, yesterday really wasn't all too relaxing as planned, but don't worry it was a great day nonetheless. Instead of lounging around I attended a cookout with some friends, studied (darn my incessant needs to be ahead) and watched the basketball game last night. So, overall it was a great day despite the original plan. And some of the best things are unplanned. Now, on to the make-up! Since I'm striving to become a freelance makeup artist there are a "few" things that I'll need in order to get the job done right. After much research and a lot of reading, I tailored from the knowledge I gained to create what I want in my kit. Yes, the list is a dozy but I promise they're all necessary. Brow Fillers- most likely will use brown eye shadows to get the job done. A Train Case- I've been scoping out by the recommendation of Ren of MakeupbyRenRen who mentioned that Yazmo was a great place for traincases. If I shop wisely I should have a "complete" kit in no time. Ok, I'm through. Creating this list, although time consuming, was necessary because I can keep better track of what I need and it'll help me to be more conscious when shopping. I've got my second interview to get ready for later and I'll be testing out a Dupe for M.A.C. 's luster drops along with a new duo fiber brush that I bought. I'll be sure to share my experience with the new purchases later on in the week. P.S. Here are a list of the sites that I used to compile my personal list. These were great resources. 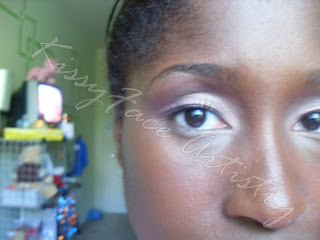 Everything was really simple but this time around I opted to try a new concealer for my under eye area. Usually I don't wear anything but, anything to build my skill level is worth attempting. I got the color latte (dark), which was the darkest color available. It seemed a little to light at first glance but I didn't let it stop me from trying it. I applied it with my ring finger in a light dabbing motion then smoothed it out. I was a bit worried that my foundation wouldn't be able to mask it well enough but i was proven wrong. 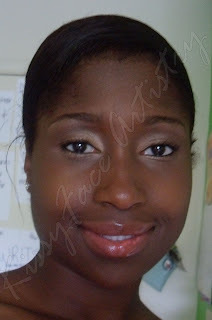 After applying my foundation on top I noticed that the lightness that I was initially worried about was a bonus. It had brightened up my under eye area really nicely. My hair in its infamous wrap. I always do it after my make-up. And that completes the look. Well, have a great Memorial Day and enjoy all the cookouts! As for me, I'll use it for ultimate relaxation. P.S. Quick Question: Is it a good idea to place a watermark over your photos? I just don't want my pics plastered elsewhere without my knowledge or proper attribution. Living in Gainesville has both its ups and downs. It's truly a college town that caters to the UF population but what it doesn't cater to is the beauty population, i.e. ME! :-). We only have only a M.A.C. counter, a quaint make-up boutique and a costume shop to feed my fix. But that definitely changed last week. 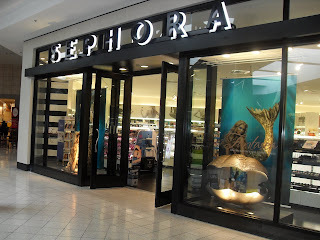 Sephora finally opened a full-fledged store. Unfortunately, I wasn't able to attend the official grand opening but I had the pleasure of visiting and playing around in what they had to offer. And pick up a few items too. was unique with the mermaids--very aquatic. being that this was freshly opened. swatch some of the colors. 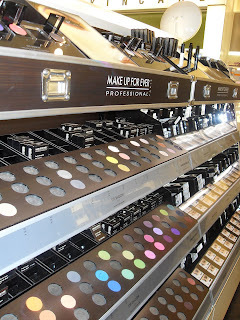 It was just so......CLEAN and.....NEW And what took my breathe away was the Make Up Forever area. 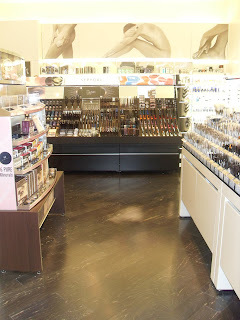 At the former Sephora, located within JcPenny, they didn't have their products available. So I was absolutely delighted to see them there. And proving how green I am, outside of the Web site, this was my first face-to-face encounter with the line. I could have played in the products all day but ultimately decided against it because I did have a long day ahead of me. For the time that I was there, I felt like a kid in a candy store. And it was delightful indeed. So, I can proudly say I have a go-to spot when wanting to build my kit with the necessities. 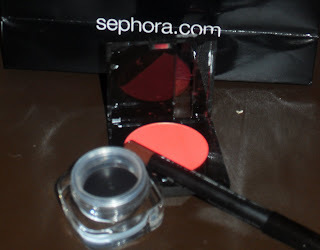 Although I'm not opposed to shopping online, nothing beats testing out products and playing in make-up in real time. 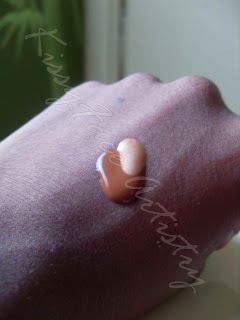 And one of the things I swatched was one of the latest Smashbox products. I was delightfully surprised by the color payoff. The most raved about items are their primers, which I've yet to try. So swatching the shadows and liking them was highly unexpected. I really loved the blue one. So I'll definitely be making regular visits. A girl can never experience and try too much, or in my case, purchase too much either. I left with a few items that I'm all too elated about. purchased. It was meant to be! As for my gel liner, the one I currently own was drying out. I wanted to try a higher quality one to see how much better it is. And its waterproof. Oh, la, la! perfect certain techniques at the moment. Sure, I still have to travel to Orlando or Jacksonville for a M.A.C store and other treasures but this is definitely a step in the right direction. Make the best of your Wednesday! This past week a friend of mine wanted her make-up done for a photoshoot and of course she reached out to me for her make-up, which I glady did. She wanted a bright look to match the aqua tank she was rockin that day. 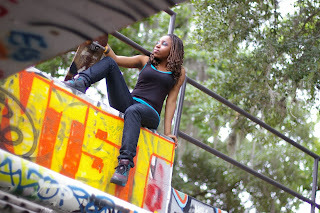 Below are a few pics from the shoot. I really wanted her eyes to pop in the session and I think it was achieved. I really think they came out lovely. 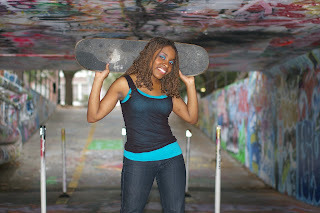 And my friend Edson Andre was the photographer. Checkout his Web site to see more of his great work at edsonandre.com I've known him for close to five years and his skills with a camera are A-Ma-Zing. *Be ready for quick changes. -Since I didn't do a consultation with her, I hadn't had enough time to prepare. But I took it all in stride and I think I handled it really well. *Have a better understanding of bases. 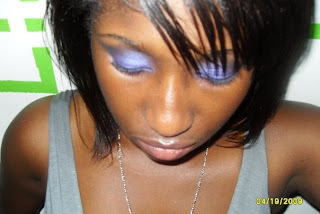 -Initially, I had her main lid color under a blue base. I wasn't too pleased with it so I changed it to white and it worked perfectly. -I really want the client to be happy with the work. So I'm sure to ask for their opinion and any specific elements they want added or subtracted. Because in they end I want them to be happy with the look I gave them. *Better options and back-ups are a must. -My collection is still in the growing stage. 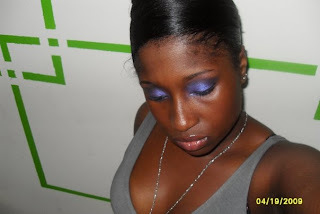 So I had to use her own foundation to give her the look. I'm still researching foundation options. Even though I hear great things about M.A.C and MUFE, it's not so pocket-friendly to add a whole set of foundation options to my kit. But overall, it was a pleasure to work with her. And at the same time have work to add to my portfolio, which I'm still deciding how best to put it together. But I'll be posting on that on a later date. To get in the habit of daily blogging & create a little structure to my blog every Monday I'll be uploading a look of the week, both to showcase some of my looks and to keep track of how my skill level is progressing. And I thought it'd be appropriate to kick things off with the look in my profile picture. My face looks better in the second picture because it was taken at the beginning of my night while the first picture was taken at the end. The look was really simple and easy to create. Simply said,I need a new make-up chair. What I've been using so far doesn't cut it. 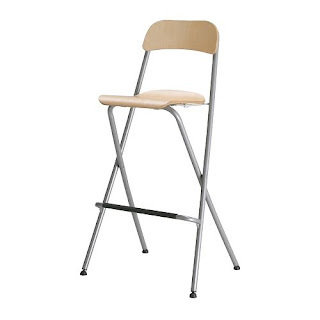 My little rinka-dink chair has my back hurting whenever I'm doing make-up with all the bending and awkward angles I find myself configuring to in order to apply my clients make-up. And it's not so comfortable for my clients which is not cool. 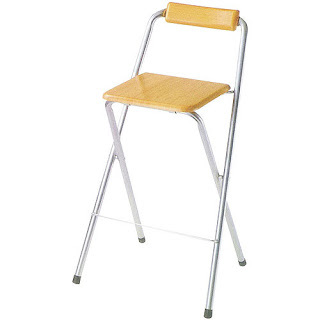 As its intended purpose as a desk chair its fine. And its use stops there. So now I'm deciding on investing on a make-up chair. I'm trying to find something portable and easy to travel with. Also, as unimportant it maybe, I want something cute. Initially I wanted just to pick up something like the options above for all use whether I'm doing make-up at home or on-location. I'm gravitating to the IKEA option, initially because of price. I can purchase two and still come out cheaper than buying the other sets. Also the higher back that it provides for the comfort of the client gives it a thumbs up in my book. But below are examples that I'm also looking to purchase later as a permanent in-home option. 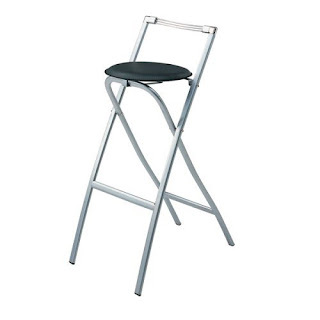 Financially, I'll make do with collapsible bar stool and then upgrade to purchasing one of the air lift stools. 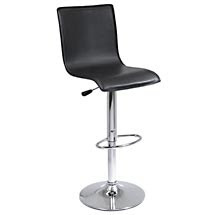 Most likely the purchase for the initial bar stool will be made by the end of the month. Look out for my next post I'll fill you in my woes and joys of graduation weekend. Business really has been picking up and I'm creating a buzz in my circle. So I'm highly optimistic that this summer for KissyFace Artistry will be on the up and up. I even plan to head to over to my local Small Business Development Center Office to make things a bit more official, get some information on being an entrepreneur and to be on the up and up on what my options are. I'll keep you posted on that too.